They were so kind to my pup!! Treats waiting for us in the room, and they provided bowls for food and water. They also had kennels available if needed. The in house restaurant had great ambience and the waiting stuff were wonderful. The front lobby was lovely with the fire and the nice sitting area. The breakfast buffet was plentiful. Tasty. It was a great location, right near the Clark Art Institute which we wanted to visit. It is a charming facility. The tavern, dining room and lounge with fireplace make for a great place to have a family gathering. They do a great Thanksgiving dinner, which my family has enjoyed for the last five years. Having said that, the place is a little tired and run down. The staff is friendly, but not the most service oriented. It is being torn down and a new Williams Inn is being built. We will see how that is! Great shepard’s pie! Not a lot of atmosphere in the dining room, but a good meal and friendly service. Room was a little run down but comfortable enough. Good location; easy to get into town. We were given an adjoining room for my handicapped for no charge because we realized we needed it for our elderly mother. They were si accommodating and the rooms were very nice! Excellent stsff. Rooms were very comfortable and clean. Breakfast was very good. Food was kept hot and there was always plenty of it. Wait staff was right there to clean up as soon as someone left. It was a great stay and I would come back again. I highly recommend it! The room was spacious and clean. The staff was generally kind and helpful. The location is convenient to bus service for people who don't have cars. The Williams Inn This rating is a reflection of how the property compares to the industry standard when it comes to price, facilities and services available. It's based on a self-evaluation by the property. Use this rating to help choose your stay! Located on the Williams College campus, this Massachusetts hotel features an indoor pool, hot tub and sauna. All guest rooms include free Wi-Fi and cable TV. 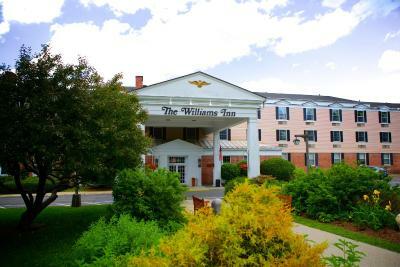 The Williams Inn Massachusetts features on-site gourmet dining and a complimentary continental breakfast. The inn’s extensive menu offers a variety of dishes and decadent desserts. Vegetarian and vegan options are also offered. 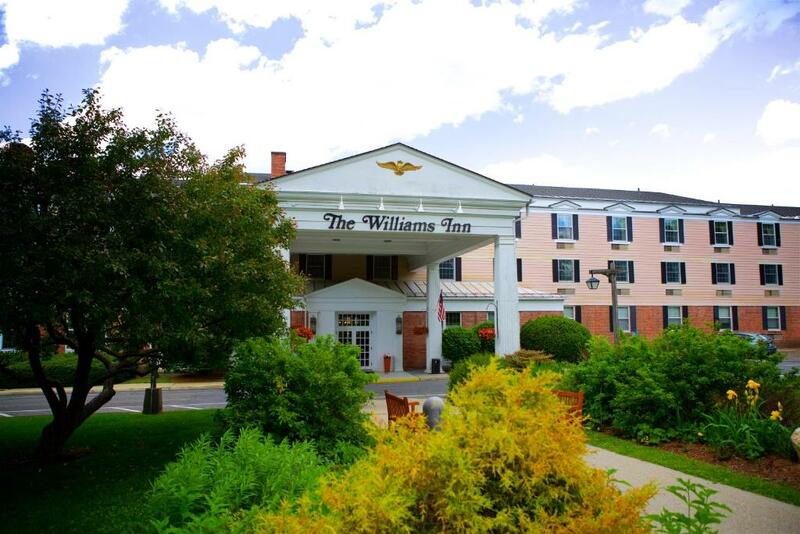 Featuring timeless Colonial décor, rooms at The Williams Inn Williamstown are comfortably furnished with floral accents. All rooms include ironing and tea and coffee making facilities. Clark Art Institute is 9 minutes' walk from the hotel. This property also has one of the top-rated locations in Williamstown! Guests are happier about it compared to other properties in the area. When would you like to stay at The Williams Inn? With two double beds, this room features free Wi-Fi and cable TV. This room features free Wi-Fi, cable TV and a work desk. With a king bed and a sofa bed, this suite features free Wi-Fi, cable TV and a sofa bed. This spacious room features a walk-in shower, separate from the bathtub. Free Wi-Fi and cable TV are included. House Rules The Williams Inn takes special requests – add in the next step! One child or adult is charged USD 25 per night in an extra bed. The Williams Inn accepts these cards and reserves the right to temporarily hold an amount prior to arrival. Please inform The Williams Inn of your expected arrival time in advance. You can use the Special Requests box when booking, or contact the property directly using the contact details in your confirmation. Decor is a little dated. The bathroom in the room could use remodeling. The electric outlet and the wall-mounted hair dryer were too far from the bathroom mirror. It was hard to get ready in the morning! No outlet by the nightstand to charge my phone. The breakfast was good, the bar area is nice, and they have a small but good selection of beer on draft. We were traveling with 3 other families; we are a family of 3 and the remainder all 4. We got the smallest room of our group, but were charged the most. I brought it to the staff’s attention and they said because they had us down with 4, so we were charged more. Makes no sense. I told and showed them we were three, they made a slight adjustment but still said we needed an extra charge for the 3rd person. Whatever. I stil think my base rate was more. I booked 3 of the 4 rooms.... Our bed was broken and horribly uncomfortable. Our room was dirty. There was a half eaten muffin under the bed. Hair in the bathroom. They took money off for that. We asked for a later checkout, so they waived the charge associated with it. Finally, they were the host hotel for Bay State Games Figure Skating. They were unable to accommodate people in the tavern for dinner. Said they were not equipped for the crowds—did not have the staff. Poor planning. You are the host hotel! I always wanted to stay st the Williams Inn, because I had heard good things. Unfortunately, not our experience. Definitely older. Will be nice to see the new location. Inn not full but our room was right across from noisy ice maker. Staff had left 2 big carts of dirty linens in hall that we had to go by to get to room. There was baked on sludge in bottom of coffee cups at breakfast. There are plans to build new inn within the next year. It shows. In the meantime, staffing and cleanliness have gone downhill. Kind of a lame duck situation. Very out dated, felt like a funeral home. The toilet was so high up your feet don't even touch the ground as an averaged height person. The tavern and pool closed at 9pm on a Saturday night which was a shame. The hot tub was out of service but not mentioned anywhere but the pool area. Thin walls, I could hear our neighbor coughing all night long. The included breakfast was a plus. Good location. Nice spacious room, comfortable elegant old style public rooms and very friendly staff. Little old fashioned, the corridors reminded me of The Shining. But new hotel will open next year which will be modern. Very handy to NYC bus to Williamstown as it stops at door. Also if you’re going to MASS MoCA the bus to there leaves at the quarter to the hour and costs $1.75. Also very handy to Spring Street where the restaurants are. Blue Mango was excellent and the bar The Purple Cow? was fun with Trivia on Wednesday night at 7pm. The staff were all very friendly. Our receptionist was very helpful in suggesting things to do, and the restaurant staff were also very good. The room was spacious with a comfortable bed. It could have done with a second chair. Breakfast and evening meals were excellent. Great location for a range of things to do. We hated the timer on the light in the bathroom which seemed be the only light in the bathroom. The bedroom was very dated but understand that they are opening a new hotel next year. The staff were lovely and the inn was in a great location. Very tired and old fashioned rooms. Even the curtains in our room were ripped. Swimming pool out of action. Rooms not particularly clean. Virtually no soundproofing, we could hear every word of the conversation in the next room. Loud bangs from the dodgy plumbing. We actually asked to move rooms because of it. Breakfast was passable but only just.